Where is it? 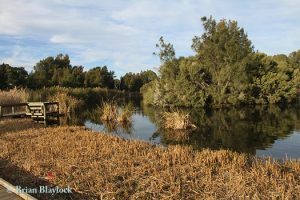 : The wetland located off Burbridge Road, West Beach is surrounded by Apex Park Reserve. Public transport is available on Bus Routes J2 (City to Harbour Town) and 162 (City to West Beach, Monday-Friday only). Alight at Stop 12B on Burbridge Road. Car parking and toilets are near the entrance. History: The wetland was built in 1993 to detain and improve stormwater prior to discharge into the River Torrens.